Khayelitsha is about half an hour drive from the Cape Town city center. A taxi drive with the minibus cost 20 Rand a single trip! 20 Rand is about the same price as a bread and a bottle of milk…. 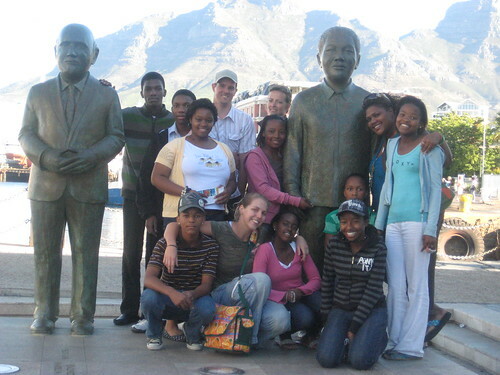 COSAT students sometimes go to bed on an empty stomach… A trip to Cape Town city is a real treat. Especially a trip that includes going up the 1000m high Table Mountain. And even better when there is the opportunity of climbing that big challenge of a mountain! Just before this great outing, I unfortunately sprained my ankle badly when a big wave threw me of my windsurfer…aaai…Who was gonna climb that mountain with the students? I enrolled my colleagues from the architectural firm and my flat mates (including our dog, Luka). This was the best thing of the whole trip. The exchange between those bright COSAT learners and this international, young team of colleagues was so inspiring and empowering for everybody! The day was grey, their shoes are old…rain or clouds, flip-flops….nothing could stop the students from climbing up! So great! I took the cable car up together with a few students and thought we would have to wait forever…. so surprised to see them all up there after 2,5 hours! A lunch with music and dance in The Waterfront afterwards made the day complete! Thanks for all the donations! Thanks Makeka design people! Thanks Michiel for the beautiful pictures! Thanks COSAT students for having the courage to overcome another challenge! After nearly three months living in Cape Town, South Africa, the last thing I would have expected to see was a bus full of white South African school children pulling into the parking lot of an elementary and middle school serving mostly Xhosa, Zulu, and Tswana children. But low and behold, a week prior to my departure, I had the chance to witness just that only a few minutes from the nation’s capital city of Pretoria. For the last two years, The Centurus Colleges Trust has maintained “outreach programs” at each of their three Christian private schools. With the exception of a handful of bursary students, the colleges enroll children from upper-middle class South African families. Most of the tuition-paying students are white. A few hail from the Indian and black families who have done well in post-apartheid South Africa. After school, the vast majority of students return to their high-security homes that include virtually every amenity a child would need for a healthy and fun upbringing: a functioning family unit, plenty of toys, a desk at which to do their homework, a quiet place to sleep, ample food in the kitchen, and often an outdoor swimming pool. But there is also something missing from the picture, something essential for raising well-balanced and civic-minded children. A good dose of reality. If it weren’t for the “outreach programs” at the Centurus Colleges, the students would have virtually no meaningful contact with the country’s majority population, which confronts daily the trauma of AIDS/HIV, the struggle of finding work and making ends meet, and persistent discrimination on the basis of skin color. Hence, the reason for the school visit Fre and I had the privilege to attend in late February 2008. After the kids disembarked from the bus, they were met with smiles and commotion as more than two hundred school children poured into the courtyard where the visitors would be received, each carrying a chair on which to sit. Through a series of culture sharing events, the two groups of South African youth had a rare chance to rub shoulders and learn from one another. The first day of the school trip was designed for grade 5 & 6 students. They were led into a large courtyard. The thirty-five students from Tygervalley College sat together near the back of the seating area. The grade 5 students performed a waltz in their Centurus school uniforms to introduce their hosts to the traditional culture of white South Africa. This quiet affair was followed by three lively African dance ensembles, performed by students at the host school. They wore traditional Xhosa, Zulu, and Tswana attire, appropriate to each of the three dance performances. Later in the day, the grade 5 & 6 students from both schools were introduced to one another and asked to find pen pals with whom to correspond. The pen pal pairings fell along expected gender lines. The girls were quick to introduce themselves to one another and pair off. The boys from both schools required a bit more cajoling on the part of teachers to get the conversations started. On the second day, grade 7 & 8 student from Tygervalley College arrived with gift baskets for grade 1 students at the host school. The decorated goody bags included candy, snacks, and a drink. After distributing the goody bags, the grade 1 students sang a song for the Tygervalley College students. The Tygervalley College students returned the favor by improvising a performance of some kind. My mind is blanking on the details. Later in the day, the grade 7 & 8 students took presented gifts of books and toys to the school library. They then spent an hour reading to grade 2 students from the host school. It’s easy to get down about the state of South Africa. Fifteen years since the end of apartheid, many of the systemic problems that characterized the darkest period of South Africa’s history persist. In the meantime, AIDS/HIV has devastated families and entire communities. South Africa’s government is failing to deliver basic services, including electricity and drinking water, to the communities that need them the most. And yet, wealthy South Africa buzzes along as if nothing is wrong. The two days Fre and I spent assisting with the “outreach programs” at Centurus Colleges allowed me to focus on something very positive. The experience reminded me that children the world over have an easy time setting aside their differences and finding common ground on which to become friends. On February 13th and 14th, I witnessed the full beauty and diversity of South Africa’s founding peoples and was given much reason to believe they could build a nonracial and socially equitable future for their country. Cape Town attracts lots of tourists with its beautiful nature, welcoming climate and its famous Table Mountain overlooking the ocean. Tourists love to hang out in the fancy restaurants, luxury shopping malls, along the Garden or Wine route or simply on the beach. Money makes the world a very small place: people fly and enjoy the sun for a few weeks on a beach at the other end of the planet. But in the same time does money create separated worlds right next to each other. How can you travel miles and miles from Europe or America and not taking the time to get to know the country you are enjoying that luxury holiday in? How can you lie down on a beach for days, while you know that there are hundreds of people trying to find a safe place to stay, just 15 minutes away? We LOVE people who do take the time to discover all the separated worlds a place embraces. We DO NOT like tourists who go to the township to take a picture of a cute black child waving at your fancy rented car. We want to see more people who come, explore and act! We want to see more changemakers in the world! This is what we told our Dutch friends Matthijs and Naomi when they told us they wanted to join us to visit a township: Great, but only if the people in the township get something out of it! The 9 students that we selected from high school COSAT (center of science and technology) in township Khayelitsha were very excited when we told them they could join us on their free Saturday to make new friends, to explain about their home, their culture, and their dreams. 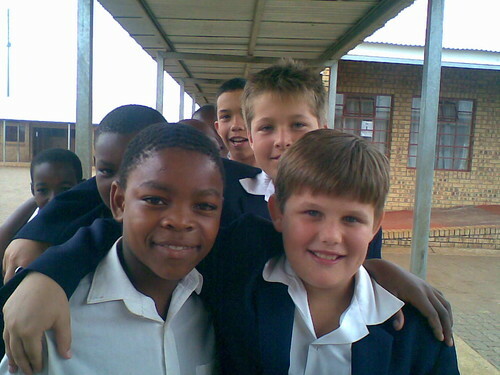 The first introduction to their Xhosa culture was during the lunch at school. A name introduction resulted in a funny –kliks- and -klaks- , trying to get this wonderful Xhosa pronunciation right. We let the students choose which museum they want to go to. You should have seen their faces when we told them they could also choose the aquarium! Wow! Only 1 of the 9 students had ever been there. After we told the students that it was allowed to ask all the questions they wanted, they didn’t stop! Those children have a huge hunger to learn. They know that education will be their path out of poverty. The stories in the car were impressive. Lwazi who lives in so-called ‘murder capital’ Nyanga explained his fear to go out on the street. It was great to see driver Matthijs’ face in the mirror, looking around because he didn’t want to miss a word. The aquarium was a great gift to the students. Exploring everything, reading all the information they could gather. And meanwhile: mouth wide open, smiles on their face. During our milkshakes afterwards we analyzed the experiences together. Sharks, penguins and Sea horses were definitely the favorite ‘fishes’ of the day! Lots of appreciations and a big thank you towards Matthijs and Naomi who sponsored the whole day! A walk through the Waterfront and some traditional dance moves on music of the Xhosa Street musicians made this day complete. Before we realized it, the sun was setting and we had to go back to the car to return the children all home safe before dark. This might have been the most interesting part of the day: dropping the children of at their homes. The realization that although these kids are very intellectual, well dressed, full of questions and joy in life….they live in the poorest places, the loudest environments, the biggest dirt, surrounded by violence, drugs and lots of people who do not have the learning skills to create this path of hope out of the circle of poverty. Matthijs and Naomi got such a great inside idea of life in a township, thanks to the communication with the students, seeing the places they live. For the students it was very enlightening to be out of the township, to interact with people outside their everyday township world. Wandile told me that it was such an honor to walk around at the Waterfront and to go to the Aquarium. He told me that lots of people in his neighbor hood never leave the township. Public transport is expensive. So unless your job forces you to go and take that 15 min bus ride, you don’t get to town. See also our gallery for some more Photos of this day..